Your smile will look and feel completely natural and confident! After the loss of a tooth, a patient has a few options: a dental implant, a bridge, dentures or no replacement at all. 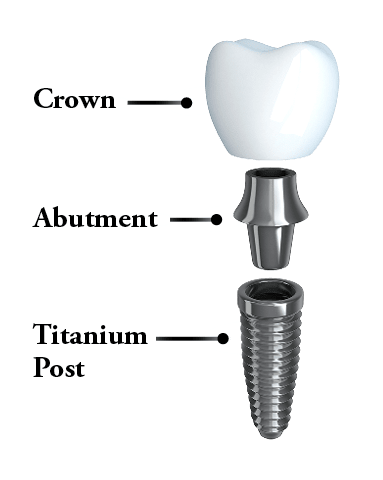 Dr. Martin and Dr. Ferraiolo of Distinctive Dentistry can give you a stunningly beautiful, natural-looking smile with dental implants in their Totowa, NJ dentist office. The personnel at your office is what makes everything worthwhile. While the technical skill is excellent, the personal way everyone in the office treats their patients is exceptional. It is surgically placed into jaw bone, for the firmest possible foundation. Then, after a period of healing, a crown is placed on top of the implant post, finalizing the restoration. Dr. Martin or Dr. Ferraiolo act as the quarterback for your restoration! You see them first when you’re considering dental implants in the Wayne or Totowa area. When you are ready for your implant, they work with a trusted oral surgeon in the area for the surgical placement. The North Jersey team closely communicates so the placement will allow the best final restoration – a crown placed on the post. Your smile will look and feel completely natural and confident!